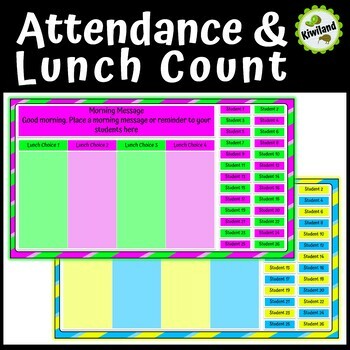 These Attendance and Lunch Order Count slides are perfect for taking a digital approach to your morning routine. These slides take the hassle out of taking the lunch orders and counting them, while letting you know who has turned up for class. There is space available to give your students a morning reminder or notice e.g. Homework, start some type of work when the bell goes, or handing in a school notice. 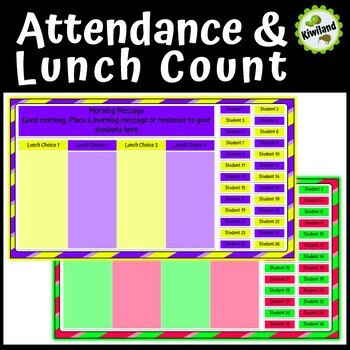 The Attendance and Lunch Order Count comes in both Google Slides and PowerPoint, with 6 colorful options to choose from. They are simple to use your computer, tablet or whiteboard. Anywhere where you can use google docs and apps. 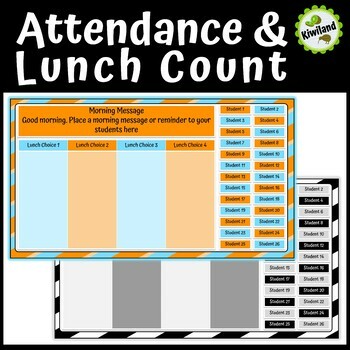 Basically, as students come into class they simply click on their name and slide it into correct lunch order.